Are You Making These HIIT Cardio Mistakes Too? « Burn The Fat Blog – Tom Venuto. While steady state cardio at a moderate intensity can deliver great results too, it takes longer workouts to get the same benefits. Lots of people find long, steady cardio boring too. HIIT is a proven method for time-efficient and engaging cardio workouts. 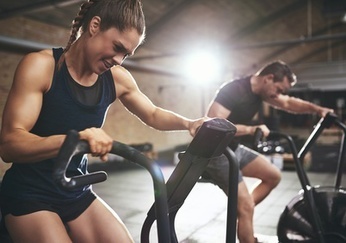 According to a new research review that was published in PLoS One, a major reason many people give up on HIIT is because they were doing it wrong in the first place – or at least wrong for their current fitness level. By making certain mistakes in HIIT, the workouts become downright unpleasant and literally force a lot of people quit. If you’re making these HIIT mistakes too and you fix them, you’ll get those great time-saving benefits, great fitness improvements and you may find you begin to enjoy interval training. You might even like it more than steady cardio. Years of extensive research has proven that HIIT is an effective training strategy for time efficiency and improving cardiovascular fitness and health dramatically given the small time commitment. HIIT studies have shown mixed results regarding whether participants consider HIIT (psychologically) enjoyable or sustainable. Some people find HIIT too difficult and unpleasant to want to keep doing it. Some people, despite the hard bursts of higher intensity effort, find HIIT more enjoyable than steady state forms of cardio. A new analysis of multiple studies on HIIT and continuous cardio suggests that the reason for this discrepancy is based on how people define HIIT differently, on how high the intensity levels are taken, and especially on the duration of the work to rest intervals used in HIIT. Some HIIT workouts are particularly physically stressful and also psychologically taxing due to their structure. Workouts that take you above the anaerobic threshold (maximum and very high intensity Interval training) are perceived with more negative responses from participants, with higher ratings of perceived exertion. When cardio workouts are perceived as negative (and non-enjoyable), it may reduce adherence, defeating the purpose of what is otherwise a super-effective and efficient workout. One factor that influences participant’s positive or negative perception of the workout is the work to rest interval. This new research concluded that HIIT workouts need to have an adequate recovery period for participants to see the sessions as enjoyable or at least tolerable enough to stick with. HIIT workouts where the work to rest interval was 1:0.5 (work to rest) resulted in participants reporting negative reactions to the workout (i.e., if a work interval is 1 minute and the recovery interval is only 30 seconds, you don’t recover fully enough during the recovery interval, the workout is a slog and it feels unsustainable). HIIT workouts where the work to rest interval was 1:1 by contrast, were seen as more sustainable and even enjoyable. (Recovery interval at least as long as the work interval). Using “HIIT” as a blanket term for all interval training can lead to some erroneous conclusions. “HIIT” is not synonymous with push yourself 100% or until you puke – there are a wide variety of interval workout configurations that can accommodate all fitness levels. One of the controversies over HIIT is whether it’s simply too hard for many people. It can be, but that depends on the structure of the HIIT workout. When properly structured, the work intervals will still be hard, but if you recover before the next one, the overall perceived exertion is not extreme. In some cases, continuous (steady state) cardio with moderately high intensities can actually be perceived as harder, less sustainable and less enjoyable than well-designed HIIT workouts. HIIT or SIT workouts can feel miserable and are unlikely to be sustained by many people if they are done with 100% all-out effort, if the work intervals are too long, or if there’s not enough recovery between high intensity bursts. But HIIT workouts can actually be perceived as more sustainable and even more enjoyable (fun, even) than steady state if the HIIT workouts are well-designed with work to recovery ratios smartly programmed. Interval training can be regressed for anyone with a low fitness level and they can be progressed over time as you get in better shape. You can make HIIT harder by increasing the work to rest ratio (longer work intervals and or shorter rest intervals) as well as increasing the intensity of the work interval. You can make HIIT easier by decreasing the work to rest ratio (longer rest intervals and or shorter work intervals). Did you make the recovery interval at least as long as the work interval? Were you thinking that doing all-out sprints (SIT) is mandatory to get results, as opposed to a hard, but not maximum effort (HIIT)? Even if the work intervals are extremely intense, if you recover before the next one, the workout overall will feel easier, (psychologically). Try these fixes, then try HIIT again, and you may find it a lot more enjoyable and sustainable, while still getting great results in less time. Affective and enjoyment responses in high intensity interval training and continuous training: A systematic review and meta-analysis, Oliviera, B. et al. PLoS One. 2018; 13(6). Excellent enlightenment, Tom. I’ve seen that I’ve actually been making some errors in my approach. I assumed HIIT was universal. I’ve actually been working in the supramaximal zone (above 100%) with 30×30 work to rest ratios. 1. What are the physiological differences or advantages to doing HIIT vs SMIT (or SIT)? 2. What are some good work to rest interval samples that a person can do and derive awesome results? On important distinction is that researchers are now making it a point to use separate terms SIT and HIIT for all out sprint intervals and high intensity intervals to keep them distinct because they were getting lumped together too much. What research has shown is that you can still get big cardio fitness improvements without having to go all out – just go hard but not 100%. This is helpful to know for beginners and for those folks who find 100% sprints not tolerable or enjoyable. A “classic” HIIT (not SIT) workout is 10 X 1: 10 intervals of 1 minute with 1 minute recovery. The 1 minute intervals are hard but not all-out – maybe an 8 or 9 perceived exertion. SIT is usually 10 second to 30 second 100% all-out sprints, with longer recovery intervals. For example the classic wingate is 30 seconds all-out then 4min recovery repeated 5 times. For example, 30 second intervals are more tolerable when they are hard, but not 100%, and in that case the 30s X 30s protocol makes sense for more people. Martin Gibala, one of the top HIIT researchers has recommended the 30 X 30 (with up to 20 repeats) with an RPE of only 5 to 9 on the work (not a 100% sprint) and all the way down to 1 RPE during the recovery intervals. The key point in this research paper as far as enjoyment and adherence go (for most folks) is that not having a long enough (or light enough) recovery interval is a main reason many people have reported HIIT as not enjoyable in the past, and by setting up HIIT workouts with appropriate recovery intervals, it’s likely that more people will find HIIT enjoyable, and stick with it better.